Then I remember the night before. If ever there is a voice suited to a hungover Sunday, it is the deep, languorous baritone of Lee Halewood, country and pop singer, who is best known for working with Duane Eddy in the 1950s (he co-wrote and produced Peter Gunn and other classics) and Nancy Sinatra (he wrote and produced These Boots Are Made For Walking among others). Like a mixture of John Wayne and Leonard Cohen, Halewood has a deliciously lazy delivery, and is strange mixture of old-school and innovator. The Night Before comes out of unusual project. 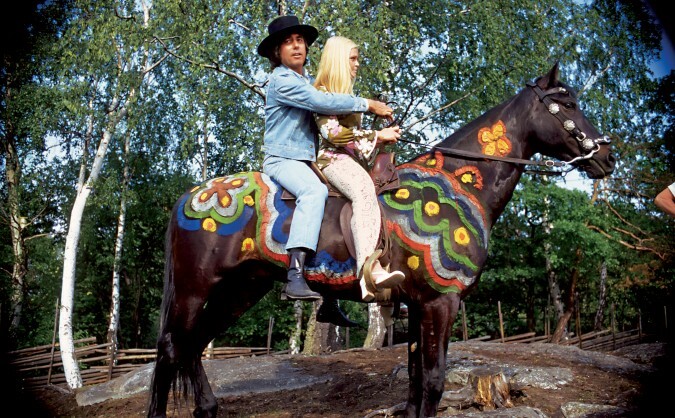 He moved to Stockholm in 1970 and recorded his experiences in a one-hour ‘documentary’ of him riding through Sweden and singing occasional songs. It is a bizarrely indulgent spectacle, very much of another era, and features guest performer Suzi Jane Hokom. The album came out of this film, and the song, including a lovely trump arrangement, certainly captures the groggy feeling of regret that comes with the discovery of whiskey bottles and presumably a woman walking out after his night of bad behaviour. Hazlewood’s drunken hellraising, womanising reputation being well known. Still, the delivery and feel of this song (written by Len Moseley) captures the mood perfectly, slowly and dryly emanating that feeling of fuzzy-headed realisation and guilt. There are things I wouldn’t do, and things I wouldn’t say.